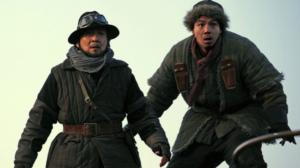 MAAC Review: RAILROAD TIGERS | M.A.A.C. 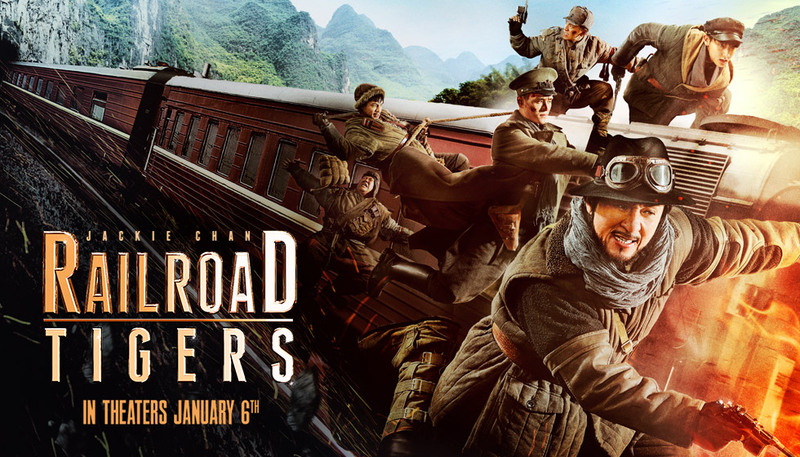 RAILROAD TIGERS is an action comedy starring the one and only JACKIE CHAN and is directed by DING SHENG. Director Sheng is best known for such works as ‘Little Big Soldier’ and more notably ‘Police Story 2013’ starring Chan himself. Here’s a quick spoiler free breakdown for those not in the know. ‘Railroad Tigers’ is basically a comedic version of ‘Rogue One: A Star Wars Story’. If that sounds strange to you I can say that I would agree. But while it might sound strange at first, the blend of a comedy with the theme of freedom fighters banding together to make an ultimate stand against oppression is rather interesting and has often good if not mixed results. The cinematography in this film is amazing. Director of photography DING YU captures this period piece with great scope and the film has a very classic but hd look to it all in one. Almost every scene is littered with historical detail from the costumes, the extras, the vehicles, the sets, the locales they shot in, the production value here is top notch on all fronts. The action choreography is very entertaining and ambitious. The JC stunt team had an intent to bring this film back to the more old school roots of comedy martial arts cinema pieces. So there’s plenty of great Buster Keaton-esque style daredevil sequences with slapstick, mixed in with heavy gun and physical combat all throughout. Now this is no fault on the film’s behalf, but the marketing hypes this as a return to the classic Jackie Chan action comedies from his early career. I think what that created is a false expectation that Jackie would go back to his risking life and limb with a wink and a laugh in the face of danger while barely managing to survive until the next stunt sequence. That is half true, the slapstick and action is there, but Chan definitely shares this film very generously with his costars. The action is more of an ensemble effort rather than Chan’s. Also this is more of a period war film so while there is physical combat and gun action the trademark JC team signature kung fu which has more flash and grace and precision isn’t really here. There’s more grit and practical action with some cartoonish brutality than there is style and finesse. That being said the best action set piece is saved for last. The train bridge sequence has just about everything and the kitchen sink thrown into it (not literally). Tanks, waves of armies, overwhelming odds that seem insurmountable for our heroes, and just the technical challenge of shooting on a real steam train and blending it with every trick in the movie making playbook combine to feel like one seamless spectacle and must be commended. This film has a large ensemble cast. 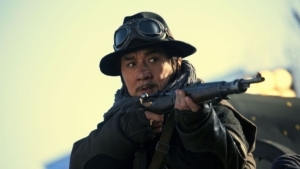 Notable in their performance is HIROYUKI IKEUCHI (Ip Man) for his turn as a very cheesy but dangerous villain. He seems to know when to ham it up and when to be a dangerous foe. Also notable is this film is Jackie sharing scenes with his son Jaycee Chan. There’s a great scene where the two bicker about Jackie’s nose size where you can’t help but feel good seeing Jackie and son sharing a comedic scene together. Actor Ping Sang who plays Da Qui is also a lovable comedic presence. He delivers his comedic lines with great earnestness and hilarious timing. Overall this is a very competent and solid action film. I’d say for the most part the blend of a period action with comedy is fairly entertaining. The only thing that throws you off at times is that most deaths (yes, this is a war movie) are played straight while others are set up as cartoonish gags so you’re a bit thrown off in regards to which tone is which. At the end of the day it’s the type of movie that fans of action comedies or just action in general can enjoy, proving that when it comes to solid entertainment this is a comedic roller-coaster of a train ride worth taking on.